Panoramic tour around Old Havana. 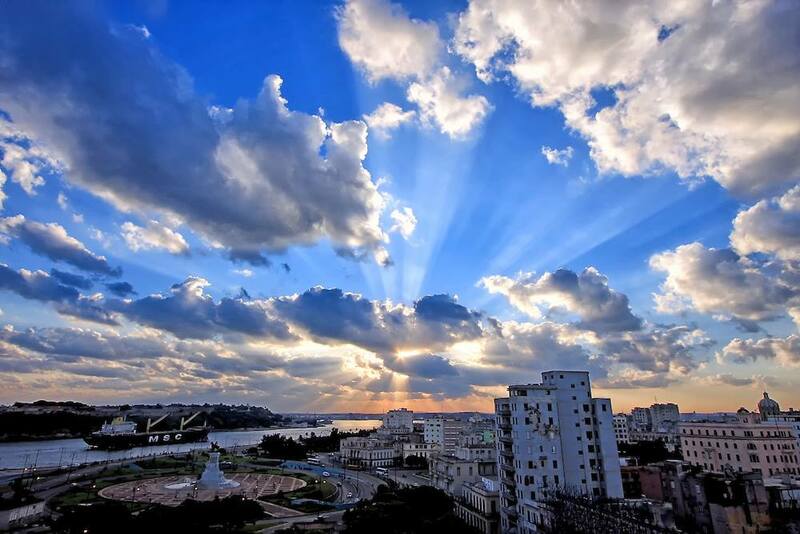 | Panoramic tour around Modern Havana. | Visit the Revolution Square. | Visit El Tablao at The Alicia Alonso Grans Theater of Havana. | Enjoy a welcome Cuban cocktail. | Enjoy the presentation of Habana Compas Dance Company. | Enjoy an enthusiastic exchange with some of the dancers. After departing the pier, you will receive a panoramic tour of Old Havana and Modern Havana. In Old Havana you will have the opportunity to learn about some of the most iconic sites and the history of this charming municipality. You will have a chance to see age-old buildings such as the Iglesia de San Francisco de Paula, one of Havana’s most charming churches, fully restored in 2000 and now used as a concert hall. Among the most significant buildings here, you will also see the train Central Station, the main railway terminal in Havana and the largest train station in Cuba, considered a national monument for its architectural and historical values. From Old Havana to the streets of Vedado in a comfortable air-conditioned bus you will get a view of the Hotel Nacional de Cuba, the American Embassy, the Cristóbal Colón Cemetery and the famous nooks, parks and plazas of this striking city. You will also have an opportunity to stop and take pictures in Revolution Square. Afterwards, you will continue your trip to El Tablao at the Alicia Alonso Grand Theater of Havana. The monumental and eclectic building of the former Galician Center was built between 1907 and 1914, as a community center and social club for Galician immigrants in Cuba. It was designed by Belgian architect Paul Belau and executed by the American firm Purdy & Henderson, author of the National Bank of Cuba and the Lonja del Comercio. In addition to a theater, the center had two ballrooms, a casino, games rooms, offices, savings bank, restaurants and cafes. The facade, the most detailed of Havana, is adorned with reliefs, bas-reliefs, balconies and four magnificent sculptures made by Italian Giuseppe Moretti, representing Charity, Education, Music and Theater. Before the start of the Habana Compás show you will have the opportunity to get to know the place and enjoy a tasteful cocktail. Habana Compás Dance Company. The artistic line expresses itself in a choreographic synthesis where the essence of Spanish dances merge with Afro-Cuban rhythms and contemporary dance through new aesthetic codes, in which dancers not only dance, but also work percussion with any element at their fingertips: sticks, castanets, heels, flip flops, keys, chequerés and percussive chairs. Since March 2004 they decided to join the Habana Compás Dance project to express in a new artistic way the acquired knowledge. Its objective is to tackle flamenco, Spanish dance, Cuban, Latin American and international folkloric rhythms based on contemporaneity in order to recreate it with new technical budgets of image and format. After a vibrant performance and an enthusiastic exchange with some of the dancers, you will return to the pier. This tour involves considerable walking, mostly on pavement. There is a significant amount of steps. The tour is not available to wheelchair guests. The use of cameras is not allowed. This tour is OFAC compliant.